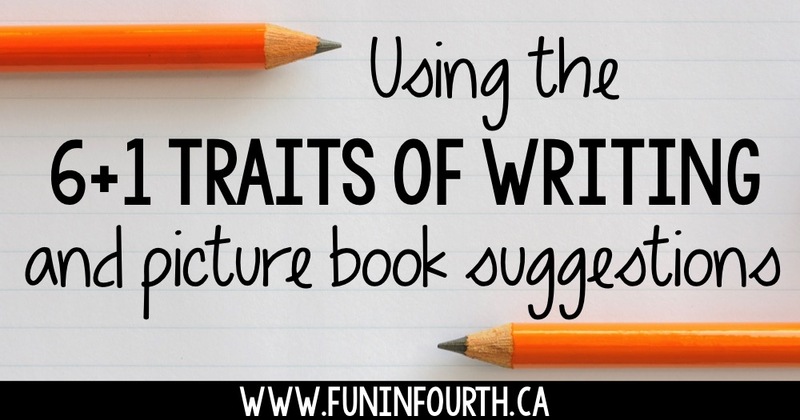 Today I'm talking about using the 6+1 Traits of Writing. Why do I teach with the Traits? It works perfectly with the B.C. Curriculum. 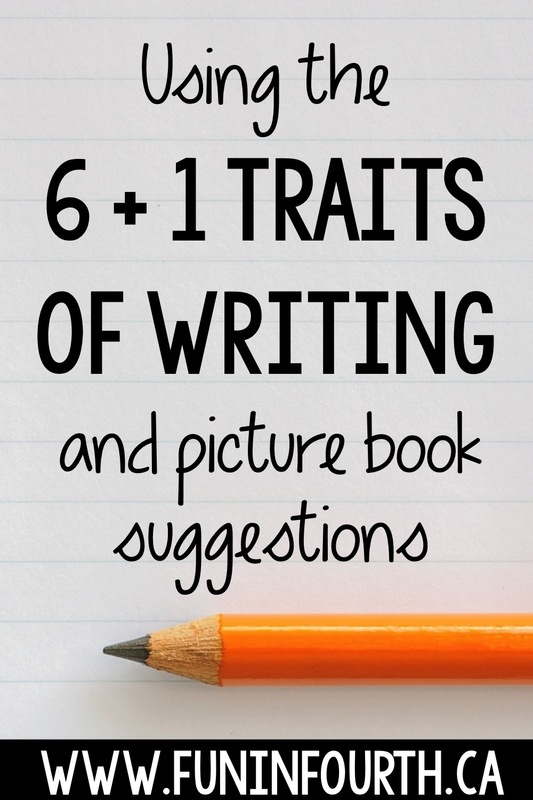 It breaks the writing process down into steps we can layer up all year. That means writing doesn't seem like such a large task. And that means, kids will usually write more because they feel a whole lot less overwhelmed. Sounds pretty good to me! 1) I have the space. 2) It serves a giant checklist students can self assess their writing on that builds through the year as we learn new elements. You'll often hear me say "just because we are working on -----, don't forget all the other pieces we already know". A quick scan of the board and students know exactly what I'm looking for in their writing. Why does it say "Use your writing VOICES?". Well, VOICES is an acronym for the Traits. They are now promoting 6+1 Traits and the +1 is Presentation. That didn't make it to my board.... but we do discuss it often. "Using Picture Books to Teach Writing With the Traits" is an excellent resource. Even though I teach grade 4, I still use it. 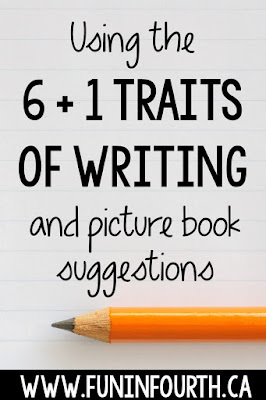 They give you a scripted lesson plan for every trait as well as several other picture books that fit the trait and how you could use them to inspire writing. I use their examples and then extend on it for my bigger kids. The story of the 3 Little Pigs told through the Wolf's perspective. Gives students a chance to think about the other side of things, and, it's funny. Or any of the "If you Give a..." books. I love how they are cyclic. You really have to think ahead to write one of these stories. Good cause and effect too. Okay, I picked two for organization. Scaredy books are organized in a different way. I love all the charts and diagrams. This book is a favourite for many reasons. It is so touching. The boy in this story is searching for the answer to what a memory is. So many beautiful answers are given to him. This book uses two words. Yo! and Yes? You can talk about how the punctuation helps imply more language than is given. I also like to teach inferring with this book. Max collects words. Although some of his words are basic, he collects some powerful ones as well. The author uses descriptive language throughout this book. I like to teach sentence fluency with poetry, because Jack's poems have such a good flow. They just roll off your tongue when you read them. And, they are hilarious. Hello, Hello, Fellow 4th Grade Teacher!! I'm eagerly awaiting the new September Currently and have been checking out other 4th grade teachaz from Farley's August Currently! Your blog looks so cute and I LOVE Jon Scieszka's True Story of the 3 Little Pigs! Must-have!! Come check out my blog when you have a chance - so glad I found your blog and best wishes on a FAB school year! This is a great resource! Courtney and I both have this one. Thanks so much for sharing it and some great mentor texts as well. It's a pleasure to have you as part of the linky!